Abraham Wolf had his drapery on the corner of Woldstraat and De Wheem, at 6 Woldstraat. 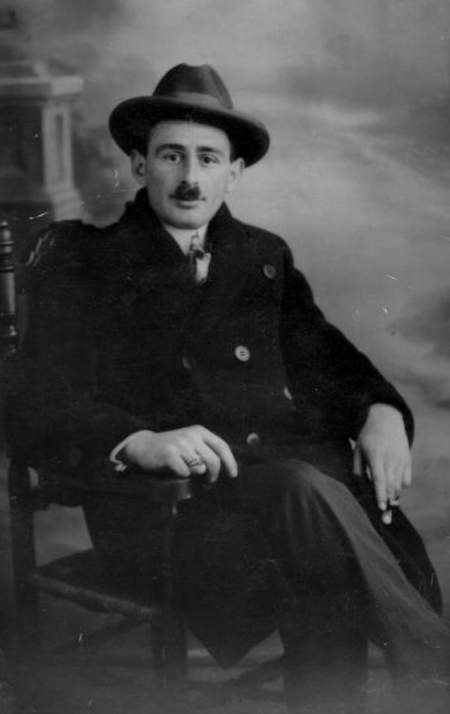 He was one of many Jews in Meppel who traded in textiles. He was born at Oss on 22 November 1892 and was married to Roosje Kleermaker, born in Amsterdam on 6 January 1888. A funny detail: Mrs.Wolf had once won a prize of 10 guilders, because her profession was similar to her name (kleermaker meaning clothes maker). On 10 February 1924 their only child Aaltje (Ali) was born in Meppel. Abraham’s brother Izak also lived in Meppel at 42a 2nd Hoofdstraat. 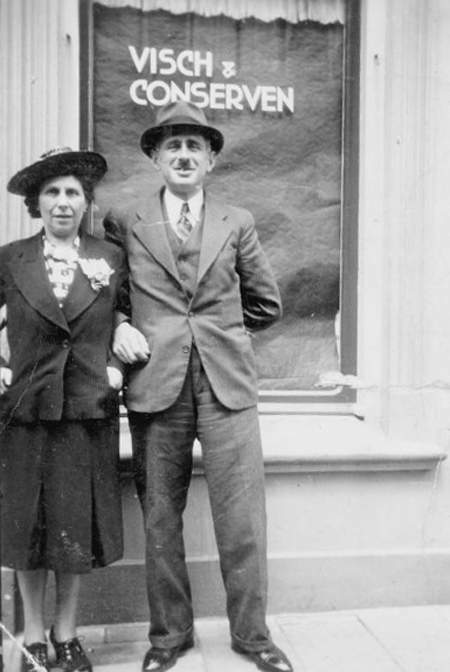 Abraham Wolf and his wife Roosje Kleermaker. At first Ali did not think circumstances were too bad during the war. Of course things happened, but she often had a day off at school. When the war broke out she was in the 3rd form of ULO (secondary education) on Het Vledder. She remembered very well that her teacher of German clearly showed in class that he was anti-German. ‘We liked that’ she said. Especially because behind her in class were two girls who sympathized with the NSB (Dutch National Socialist Movement) and showed this quite clearly. She was not very much aware of the war; everything was still allowed. She was young and quite optimistic, like her father. Her mother had a totally different disposition. When the Germans invaded the country she instinctively felt things would take a turn for the worse. She more and more retired to her home and even drew the curtains as much as possible to withdraw into her own safe little world. It was bad luck for her that they lived opposite hotel Westerbeek, where Germans walked in and out all day, while their (military) cars were parked next to and opposite their house. We had to go to the Town Clerk’s office in Akkerstraat. Tinus Koster, who worked there stamped a large ‘J’ on my card and I remember thinking: ‘Couldn’t you have omitted this secretly?’ You know, I knew him quite well, because his sister was a friend of mine. Ali passed her exam and started working in the office of Wolff’s shoe factory in Kruisstraat. This only lasted three weeks, till a German Verwalter took over and dismissed her straight away. Fortunately she got another job as a volunteer at hairdresser’s Frontroth and in the office of the chrome leather factory of Rijkmans on Paradijsweg. At Moritz Lobstein’s intercession (he was in the Jewish council) she got permission to give creative classes to young Jewish kids. In the mean time the Rechtsgrundlage (regulation 48/1941) had been created for the appointment of Verwalters (administrator or trustee). The transfer of Jewish enterprises to Arians and the liquidation of Jewish businesses could start now. This meant Ali’s parents had to close their shop. By the end of 1941 the Generalkommissar für Finanz und Wirtschaft ordered its liquidation. Mainly Omnia was put in charge. Mr. Seuter was authorized to handle the matter. One morning he came to the shop and told Mr. Wolf: ‘The shop is no longer yours’. An inventory was made and they were no longer allowed to touch the goods. Soon a truck appeared and took all things away. Then the matter was officially settled. On 23 May Abraham went to the other side of De Wheem, where the Chamber of Commerce was situated, to report his business had gone into liquidation. From 26 August Mr. Wolf’s drapery no longer existed. I, the undersigned, Roosje Kleermaker, wife of Abraham Wolf, living in Meppel, hereby declare that in 1941 her husband entrusted to his brother Izak Wolf, also living in Meppel, a box containing eight hundred and twenty six Dutch guilders. 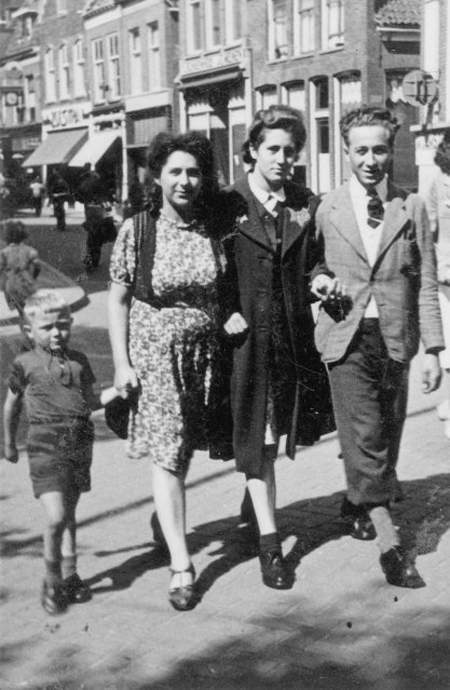 Mid-1942 (from left to right) Rudi Roos, Ali Wolf, Lia Roos and Loeki Zaligman are walking through the Hoofdstraat. I had to hand in my bike, which I had just been given for passing my exams. I then worked illegally with the firm of Rijkmans, in the office and at his home. Mr. Rijkmans said: ‘Bring it here, don’t hand it in’. I took it there, but after one day I fetched it again, as I was afraid of the Westerbeek family and handed it in. Christians had not been allowed to visit us for a long time. They did once in a while but in secret of course. Jewish ladies did visit each other and had a meal together. From July onwards a lot of Jewish men were recruited to be sent to work camps. My dad went to Orvelte on 20 July. I have never seen him back. I remember Corrie Westerbeek of the hotel saying to my mother when my father had to leave: ‘The good ones have to suffer with the bad ones’. We sometimes got letters from Orvelte. Always positive, that is what my dad was like. ‘I’ll come back’ he wrote then. On 17 August some twenty boys went to the work camp at Linde. The emotions ran high when they departed from Het Vledder. Their mothers were desperately frightened. I still remember running to the Nederlandsche Bank on Stationsweg to get some German money for those guys. A silly idea, but one felt the urge to do something for them. About that time also the girls had to do some work; they had to dig potatoes at de Lankhorst. We did that for about two or three weeks. It did not amount to much, a lot of talking and waiting. Around that time there were also the first rumours that we were to be sent away. I still remember Dien Mol saying: ‘You will be fetched on 2 October’. A few months before 2 October 1942, the date on which all the Jews who were still in Meppel were arrested and taken to Westerbork, Izak Wolf, mentioned above, as he told me, the undersigned, entrusted the aforementioned box with its contents to Mr. Tj. Boven, electrician, living in Meppel. So Bram’s box moved from his brother Izak to the latter’s neighbour Tjeerd Boven. Mother and daughter Wolf went into hiding on 2 October 1942; Abraham did not survive the war. On 3 October he was taken from camp Orvelte to Westerbork, where he stayed for a while. Before 31 December of that year he was deported to Auschwitz, where he was killed on 28 February 1943. Their house in Woldstraat got a different destination. Friedrich Besier- also Beauftragte for Omnia in Meppel for some time- went to live there and set up his Verkoopbureau voor Duitsche Textielfabrieken Fr. Besier (import firm of German textiles). On 2 October 1942 Roos and Ali were given a tip off by a neighbour: ‘You will be taken away. You must go underground’. That is what they did. After having wandered about for a while, they found a place with the Pauptit family at Staphorst, where they lived in hiding for two and a half years. They could not even go outdoors. There came an end to their underground life when the Canadians freed Staphorst. Together they went back to Meppel. Of their possessions hardly anything was left. They did not want to return to their old (rented) home. They went to live at 51 Weerdstraat. Ali started work again, first at Rijkmans’ leather factory and later with Lobstein’s spice firm. 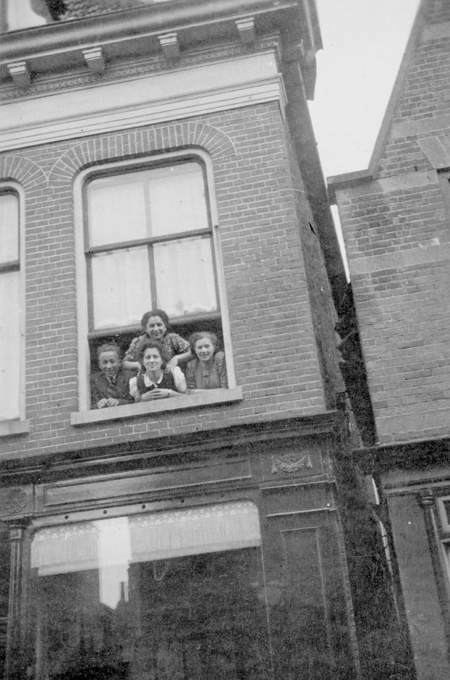 Roos started a boarding house in their house in Weerdstraat. One of her lodgers was a Jewish cattle trader from Dresden called Herman Stoppelman, who later on married a German girl in Meppel. Till a few years ago he was the last Jew to be buried in the Jewish cemetery in Meppel. In 2004 however, Nanny Mendels-van der Sluis from Apeldoorn died. She wished to be buried in the Jewish cemetery in Meppel, the place where she was born. Mother and daughter Wolf left Meppel after some years. Roos went to live in a Jewish home for elderly people in Arnhem called Beth Zikna, together with her sister from Venlo. Ali got a job in Leiden. After her marriage to Salko Kats, they went to live at Beilen. They had three children. Ali Kats died on 22 September 2004, 80 years old. A picture in remembrance of Ali Kats.